[Jakarta, LTTW] The youngest generation of today, famously dubbed Generation Z (also known as iGeneration) was born in the middle of new and ever-changing technological advancement. It’s just normal if massive numbers of them are indulged by the convenience brought by digital technology. They prefer interacting with friends through social media than playing in the park, or watching video memes than reading books – especially the printed ones. It seems to be the latest form of “comfort zone” in this century. But there are still a few of them who feel that their “comfort zone” are not as comfy as they thought. 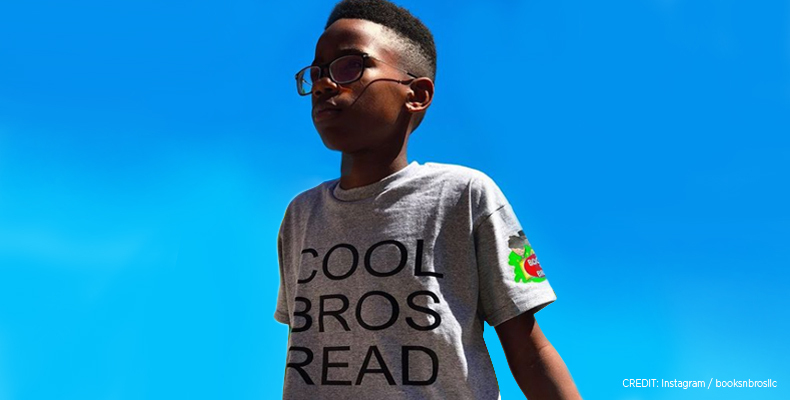 Meet Sidney Keys III, a St. Louis native and Founder of Books N Bros – a reading club aiming to encourage reading habit and criticism for boys. That is the reason why all of those “privilege” doesn’t stop him doing from what he loves most; reading, reading, and reading. In fact, Keys doesn’t just love to read, he also has a hunger for discussion. “…I wanted to read a book but I also wanted to discuss it with other people,” says Keys in an interview with St. Louis on Air. This hunger is what triggers Keys and his mother to initiate Books N Bros.
Recited from St. Louis Public Radio; back in 2016, Keys and his mother, Winnie Caldwell went to visit EyeSeeMe, a bookstore in University City, Missouri, which focuses on African-American children’s literature. While there, Caldwell shot a video of Sidney reading in the store and it went viral on Facebook. After the video went viral, she and Keys sat down to think about what he wanted to do next. Books N Bros immediately jumped to mind. Knowing that boys don’t read as much as girls, Books N Bros is specifically designated for them. “We specifically reach out to boys around ages 8-10 because that is statistically the age they stop reading — we wanted to combat that,” Caldwell said. Not enough with only to encourage boys to read, together with EyeSeeMe, Books N Bros also helps African American boys to learn more about their identity and roots. In fact, now the club is filled not only with boys, but also adults – from all different races. It’s such a “salad bowl” for the mind, and we’re pretty sure it will be an even wider educational movement. It is said that all races can be a part of this, but on the other hand there are invitation to learn the African American identity and roots. Does it limit other races? Or does it give other races to learn about African American as well? Or it goes something beyond than that and keep changing as a book club for everyone? It’s mainly addressed for African American boys, but everybody are welcome to join. I think it’s okay to be just that; even with specific symbols, stories have universal values and messages where everybody can relate to it regardless their skin colors. Wow, interesting background. Sidney and his mother are such a perfect team; they support each other. Keep up the good work Books N Bros!